There is a 'cite' option available in the English Wikipedia's Wiki-editor which is missing from most other language's Wikipedia. How to get this option on your own language's Wikipedia can be found here. Once, you have the 'Cite' option placed, you will see that the options you are getting under the Cite-template are all in English. Now, its an obvious thing that in your language's Wikipedia, you will not want to have a Citation template which shows options in English, you will want the options to come in your own language. 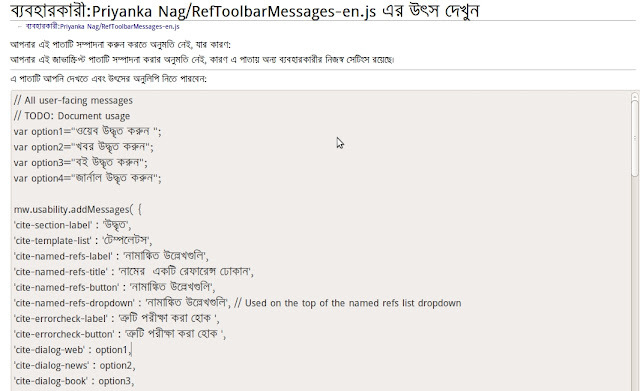 Now, I have done it for Bengali Wikipedia, and here is how I got the citation template and its options in Bengali for the Bengali Wikipedia. Well, instead of Messages-en.js, we are free to use anything else like Messages-bn.js etc but we just need to make sure that wherever this page is being called from, the name is rightly placed there. In this file, there are the set of strings which needs to translated. Once all the strings of this page are translated into the local language, the Citation template in ready to go, in the local language. The work is this simple. No more modification is required anywhere else.